Up till now (as you have seen) pretty much regardless of what I was doing the weight was coming steadily off. Well now I’ve hit that plateau where I’m 10 lbs over my pre-baby weight, Tyler’s 6 months and just started solids, and the scale isn’t budging. I’m sure that the fact I have a cold and have been super stressed aren’t helping anything. Since I am still sick and a little overwhelmed (although the potential bad news referenced last week looks like it will NOT happen now..so that’s a relief!) I think this week I’m going to focus on one thing and one thing only…kicking the after dinner snacking habit. Now Abbey from Living My Moment who is one of my gals who is faithfully linking up with me has kicked this habit through Not So Fat….and I feel SUPER guilty that I haven’t managed to! Especially since after dinner I’m never really hungry..that’s just the time of day I really start craving things..especially sweet things! So kicking the habit once and for all would save me a bunch of useless, unhealthy calories! What one thing do you want to focus on? How are you going to keep your self accountable? Link up in my comments! So I’ll be linking up with them and you can feel free to as well! This week, cutting back on the carbs. Needs to be done! You can use my fb wall or twitter feed to your little heart’s content this week. I’m usually on after dinner so if you need a little DON’T DO IT! I’m your girl! You’ll be fine. Just step away from the kitchen! Grab a piece of fruit after dinner if you have to have something. I know, I’m not linking with this or doing this…in another say…6 months I will be lol. But anyway, that’s what I do when I’m starving and all i can think about is that chocolate cake in the fridge. I grab a banana or apple and put a bit of peanut butter on it. It’s really healthy and if it’s an apple or pear or something, it’s a lot of waters anyway. So…maybe that will help? I know a bit how you feel, I’m starving all the freaking time right now but am trying not to give in to everything. Brush your teeth after dinner! It will deter you from wanting to eat. And also help you only drink water. 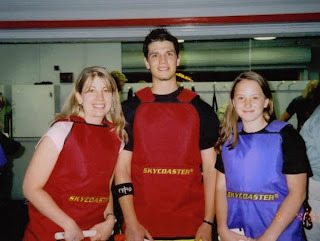 And I miss the skycoaster!! Derek won’t go on it with me lol.